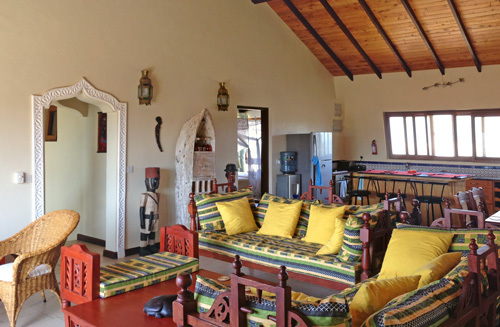 Blue Bay Cove Penthouse 4 is a privately owned 3 Bedroom Penthouse apartment, set over the upper two floors of a three story building in the exclusive 12 apartment complex of Blue Bay Cove in Watamu. The living area is open plan, incorporating the kitchen with breakfast bar, dining and sitting room, all encompassed by a high pitched roof, giving a spacious and airy feel. There is a flat-screen TV in the living room with Satellite TV and Playstation. Doors open from the living area onto a balcony which also looks out over the Ocean and the gardens of Blue Bay Cove. The Penthouse, along with the other 12 apartments, has use of the Blue Bay Cove swimming pool and laundry facilities, and there is access to the private beach below. BEDROOM 2 Double Bed Fitted Mosquito Net – Overhead Fan – ensuite shower – private verandah. BEDROOM 3 2 * Single Beds Fitted mosquito net – overhead fan, air-conditioning and ensuite shower.